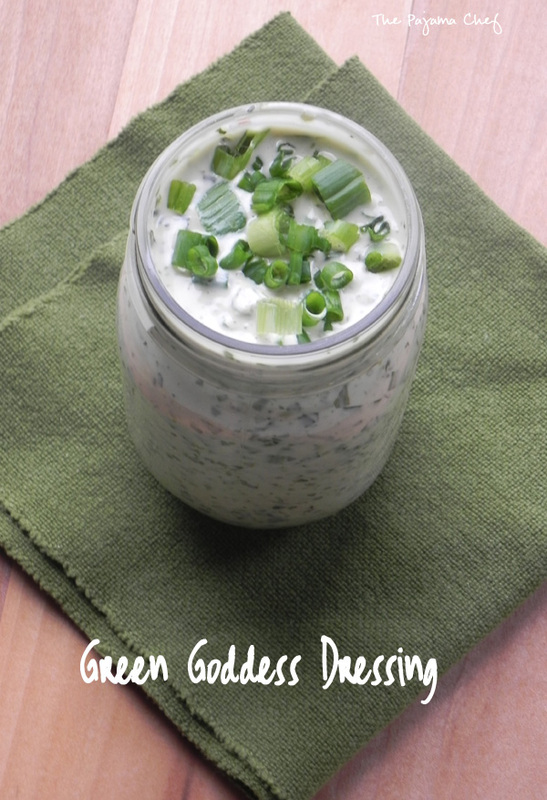 A creamy, tangy dressing filled with lots of fresh herbs and onions… green goddess dressing is divine! Hello, friends! What a week! We just moved and are getting settled in our new home. But I couldn’t miss out on the Secret Recipe Club this month so I made my recipe wayyy in advance. So unlike me. 🙂 This month I was given Jenna’s blog, The Painted Apron. Jenna is a lovely woman who gets to divide her time between Birmingham and Orange Beach, Alabama. She loves her family [just browse her blog for adorable grandkid photos! Awww. ], football, and hospitality. My husband was very sad to learn that she’s an Alabama fan and wants to say GO BUCKS! OH! He’s a major Ohio State fan and is still basking in the glow of Big Ten > SEC victory in the National Championship last January. 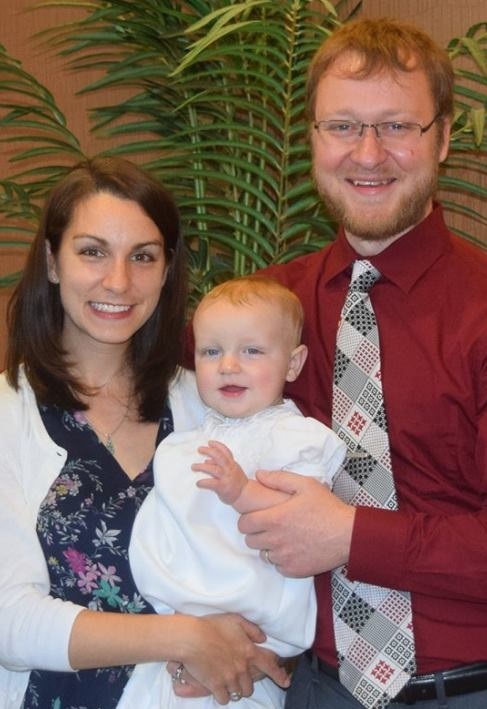 All that aside, it was so fun to check out Jenna’s blog this month. Some of the recipes that caught my eye included: Creamy Corn Dip, Cranberry Salsa [must make at Christmas! ], Cinnamon Roll & Sausage Breakfast Pudding [this would be an awesome dish to make while on vacation… we always stay in condos so low-prep recipes are great! ], Apple Pear and Walnut Gorgonzola Galette, and Savory Apple Pie Quesadilla. I must have been in a fall mood when I browsed her blog, but I eventually settled on this great salad dressing. I know I’ll be able to enjoy it all summer long! Combine all ingredients in a jar or small bowl, then process with an immersion blender until smooth. Serve as a dressing or dip. I enjoyed my dressing with this Asparagus and Chickpea Salad from A Nutritionist Eats [ingredients: red or butter lettuce, sauteed asparagus, sliced radishes, chickpeas, crumbled feta, and sliced hard boiled eggs]. Dressing keeps well in the fridge for about a week. Enjoy! 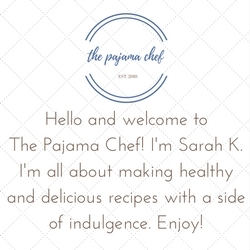 Check out all the other delicious recipes made by my friends in the Secret Recipe Club this month! So, I used to post once a month on a blog called Today’s Housewife. In fall 2012, the group decided together to stop posting due the busyness of life and families and such. Though sad, I enjoyed being part of the group. As of early January, the blog was officially taken down. But I don’t want to lose my recipes, so periodically I will be reposting them on here. Enjoy! 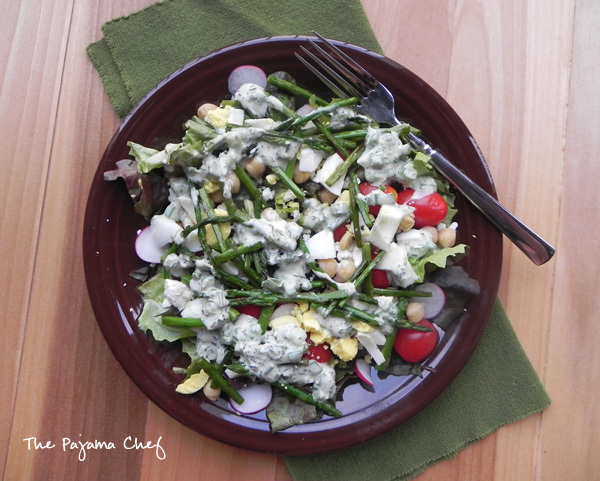 from April 14, 2011… this salad is delicious and I need to make it again! My husband and I each take our lunches with us almost everyday, him to work and me to grad school. Not only is it less expensive to pack lunches, but it’s a lot healthier (and tastier) than eating out as long as you pack the right things. I discovered early on in our marriage that the best way to ensure that we each had delicious, filling lunches that would rival anything at a restaurant was to spend some time in advance doing some lunch preparation. So I started spending an hour or so every Sunday after church prepping our lunchtime vegetables and making a grab-and-go main course option. Then, every week night while we’re cooking dinner or cleaning up, we assemble our lunches for the next day. Having components in the fridge ready to go makes it a snap! Pasta salads are one of my top choices for packed lunches as they are good served hot or cold, are customizable, and can be quite filling depending on the ingredients. I love that I can make a big batch to eat from throughout the week. 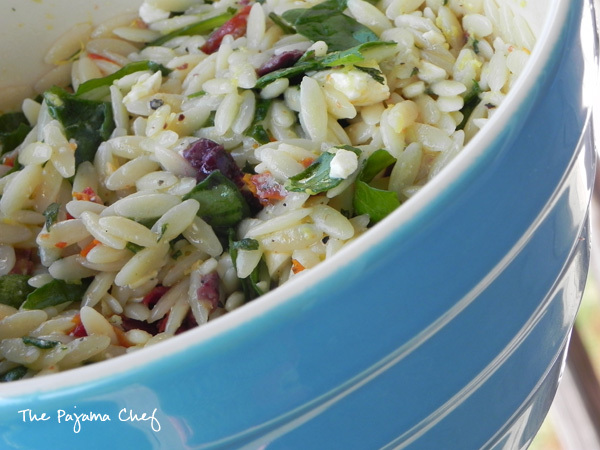 This Greek-inspired dish was born out of the need to finish some random ingredients taking up space in my fridge such as a jar of sun-dried tomatoes and Kalamata olives that I used in a recent dinner, Pantry Pasta for Two. Each bite is a little different, and the sweet tang of lemon and tomatoes coupled with the bite of olives and the rich flavor of feta cheese is incredible. You’ll have to try it to believe it, but one bite and you’ll be hooked. It’s like a trip to the Greek Isles without every leaving your lunchbox! Not that I’ve ever been… (hint, hint husband!) I’m not sure this is a super kid-friendly dish depending on picky eaters’ palates, but I think it’d be great for girls’ lunches or family gatherings. Enjoy! Prepare orzo according to package directions. Before draining, be sure to reserve 1/2 cup pasta water. If you’re like me and don’t have a fine strainer, place a (unused) coffee filter inside your regular strainer. Then drain your pasta carefully so as not to tear the coffee filter and spoon the pasta into a medium bowl. Immediately stir in sun-dried tomatoes, olive oil, olives, lemon zest, spinach, and parsley. Mix gently to combine, then add lemon juice. Add feta cheese after a minute or so to let the pasta cool off (unless you don’t mind melted feta cheese). If needed, incorporate a little pasta water to make sure everything is fully coated, especially if you’ll be storing the salad for more than a day, as the sauce tends to be absorbed by the noodles over time. I used about 2-3 teaspoons of water. Season with black pepper to taste. Cover and refrigerate for at least an hour before serving. 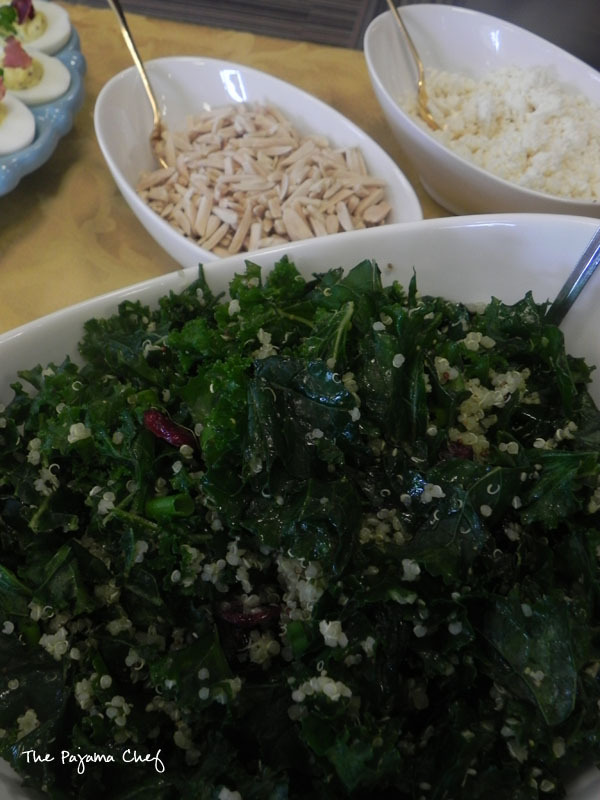 When I was asked to cater the bridal shower, I was told that the bride loooved kale and quinoa. This salad was the direct inspiration of that. Well, and of Smitten Kitchen. Ha. But anyways, this kale quinoa salad is just SO good, you guys. It’s so fresh and delightful, I could seriously eat it for breakfast and be happy. With a fried egg on top? Oh goodness, I think I’m going to try that really soon. Like any kale or quinoa salad, the sky’s the limit on mix ins. I just used some basic, affordable pantry staples: dried cranberries, almonds, and feta, but feel free to adjust based on your preferences. I’m a huge pistachio fan myself and think think that would be yummy. Oh, and don’t skip the dressing! Sometimes I just wanna do a basic olive oil rub on kale or quinoa but taking a couple minutes to mix up this vinaigrette-eqse dressing is totally worth it. Enjoy! 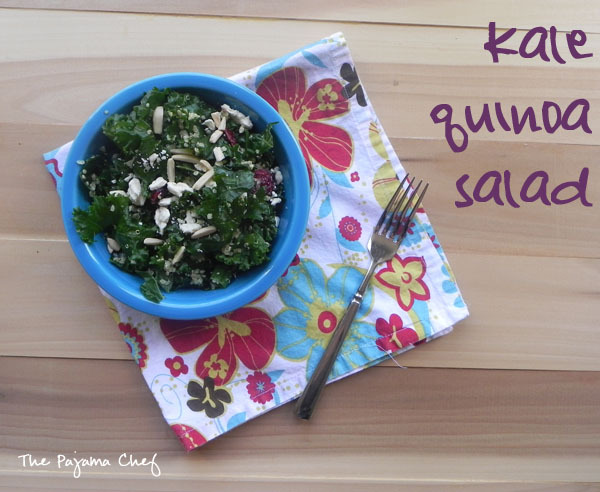 In a large bowl, toss together quinoa, kale, cranberries, and scallions. In a small bowl, whisk together the dressing ingredients: olive oil, viengar,lemon juice, mustard, honey, and dill. Taste and add salt and pepper as desired. Pour dressing over salad and toss well. Refrigerate for at least 30 minutes before serving to set. Top with almonds and feta just before eating. Time: 40 minutes [10 minutes active].